How is our creek restoration project doing, you ask? It is "settling in"--things are growing, I would say. Here is a long shot of the bank at the almost 90 degree turn that the creek makes and a close up of the grass which is growing very nicely, through the macrame-like carpet support that is, I suspect, part of the anti-erosion, new bank material. I don't know if the planting of bushes and trees will be taking place this fall or early next spring. We shall see. If you missed any of the first three reports, with photos, see blog entries on July 26, August 6 and August 13. On another note, we received the nicest, supportive and complementary editorial in our local newspaper, the Erie Times News, Wednesday morning: "Benedictines lead quest for peace." The result was that over 200 people showed up that evening for the first of monthly silent walks for peace. WOW! Thank you Benedictines for Peace committee for your idea and efforts to get this latest venture started off and for making it one that welcomes participation by the whole city of Erie. This week, fifteen of us were able to take advantage of an invitation for a sailboat ride on Presque Isle Bay one evening. Oh my! 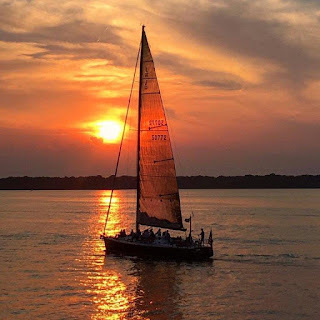 the water was like glass, the temperature was warm, the breeze just enough for the sails to be up, and an hour and a half trip became a soothing and beautiful balm for a late summer day. One of our sister's friends took this photo from the shoreline, not knowing it was we and our boat. Yes, it is this glorious. Thank you, Bill and family. Within the continual, almost daily upsetting and disturbing news reports about our upside down political situations, beginning with Washington, DC and spreading out from there, the beauties all around us help me keep hope alive....especially in the belief of the basic goodness of people of good will and, as seen here, in the awesome beauty of the natural world.....frankly, the world that is made up of other life than human beings! Courtesy of the man fishing. The monarchs are passing through. The purple martin will be right behind in a few weeks. A surprise bloom here in the final weeks of summer and it is a real beauty: tall, seemingly delicate, yet they are staying vertical by some magical power, I'd say! Google images seems to support that they may be amaryllis--which, of course, reminded me of Professor Harold Hill of Music Man fame and the little girl who played Marian, madame librarian's piano student: Amaryllis. Meanwhile we are also experiencing a late summer surge in guests--though that in itself is not unusual. Our Sunday liturgies have been larger than usual for the past few weeks and I believe the "culprit" is family reunions. Happy, laughing multi-generational groups seem to be with us every week, many we certainly know, of course, and we look forward to seeing these out-of-towners every year. One of the blessings many of our sisters give us when they pass onto eternal life is a continuing relationship with their family members. It keeps our memories of them warm and alive. We are indeed blessed. They were cute and made me nostalgic for my 25 years of teaching high school. This nostalgia is always greatest at the beginning of a new school year and that is right now. 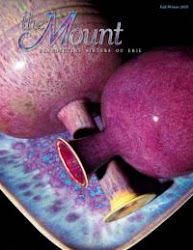 Secondly, I am reading a quirky book and I do love anything quirky! 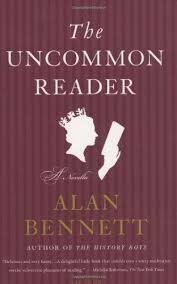 The title is The Uncommon Reader by Alan Bennett. It's a little book, in size and length, and is one continuous chapter about the Queen of England suddenly becoming addicted to books--and what effect that this constant reading has on her, her obligations and every other person in her life. Here's part of Publisher's Weekly's review: "Briskly original and subversively funny, this novella sends Queen Elizabeth II into a mobile library van in pursuit of her runaway corgis and into the reflective, observant life of an avid reader. Guided by Norman, a former kitchen boy and enthusiast of gay authors, the queen gradually loses interest in her endless succession of official duties and learns the pleasure of such a common activity. Bennett has fun with the proper behavior and protocol at the palace, and the few instances of mild coarseness seem almost scandalous. It's a fun little book." The environmental engineers are hard at work on our creek, making it healthier, to put it in a nutshell. Here are this week's efforts--primarily shoring up the bank, especially at a near 90 degree bend. Our annual Learning, Leisure and Legislation summer community days are this week and they already are off to a very good start. Great conversations and sharings Wednesday on issues on our past, present and future that engage and energize all of us. Tuesday night LLL opened with a lovely Evening Prayer followed by a dinner and celebration of our six jubilarians this year: three 70-year celebrants, two 60-year celebrants and one Golden jubilarian. Our inner courtyard Blessed Mother is surrounded by clematis and hydrangea these days and they are truly stunning. Out on East Lake Rd, down by the entrance to Glinodo you'll find this old, weather-worn, utilitarian fire hydrant. Never noticed, never needed (hopefully). But, at this time of year the roadside chicory circles it with a kind of beauty it certainly isn't used to!